And so the second bathroom renovation gets underway! The bathroom is small but serviceable in its current state, but with room for improvement. While there is some storage under the sink, the corner has a ton of wasted vertical space where I dream of a linen cabinet. The tub is outdated, and the use of a shower curtain (as much as I love our Chicago El themed shower curtain) effectively cuts the room in half when closed. We are envisioning a pedestal sink to create more room for the linen cabinet, an energy efficient toilet with the dual flush system, a new tub with a slick shower door and a color theme with gray walls and finally using the cheery yellow towels we got as a wedding gift! We spent last weekend creating a budget, sourcing pedestal sinks and tubs on Amazon.com and two trips to the Tile Outlet. First up, the reason we're going to see some savings in this renovation is because of a deal we took advantage of using Turbo Tax. We applied $500 of our tax refund to our Amazon account and received 10% cash back, an extra $50 in our pocket. We figure we'll be able to buy the Nest thermostat, the accessories we need for the bathroom and maybe the pedestal sink or toilet if we find the same type in the store first (I'm a big believer in seeing what we're going to purchase in person first!). So onto the Tile Outlet. 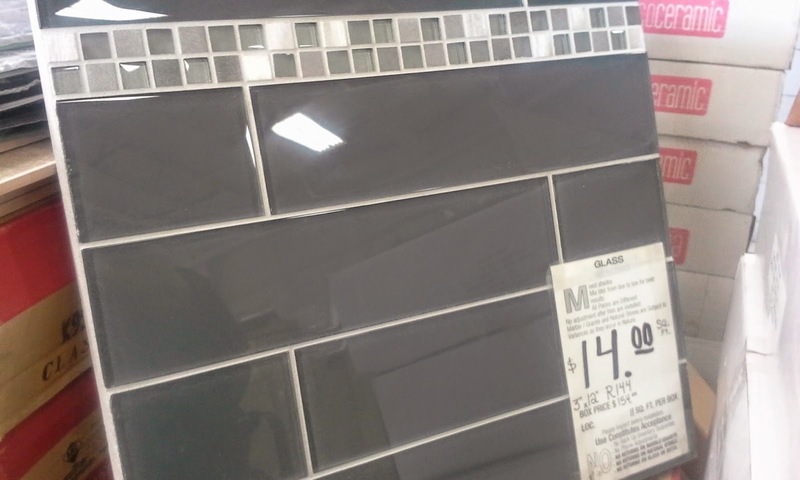 We are planning on a dark gray floor tile that will also go up the side of the tub to tie it all together. The shower and tub walls were our focus of this weekend, though. 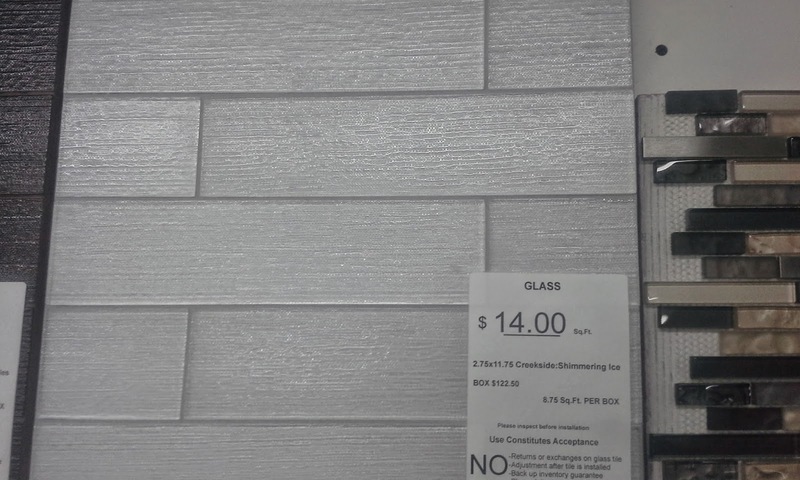 We also want gray walls, so our original idea of gray glass tile started to wane as we got a little "gray on gray on gray" weary. Instead we feasted our eyes on Shimmering Ice Creekside by Bellavita and were hooked. We love the texture and the idea of organizing the 3x12 tiles in rows opposite rows of 2x6 tiles like in the photos we found online. To mix it up a bit, we picked up enough gray glass tiles to create two rows to help tie it back to the room. The Tile Outlet did not have the 2x6 size, so we'll need to order it online. Currently searching for the best price, cheapest shipping and most reliable site. 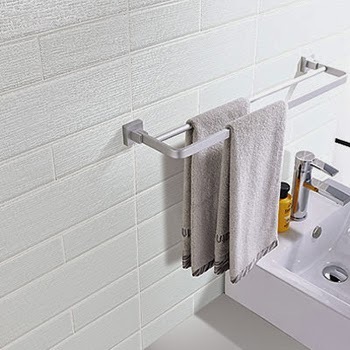 Shopping at the Tile Outlet could be frustrating because the choices can be limited in some respects (they might only have two boxes of something you love), but the savings don't lie - $3 a square foot multiplied by 40 square feet! Now 6 boxes of tile sit in our garage spot, waiting for the day to be applied to the wall. 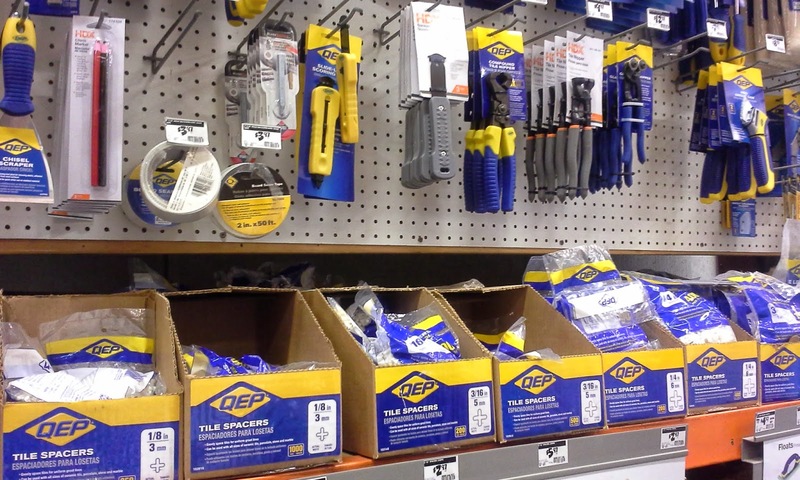 Speaking of, our next stop was Home Depot where Bob used the better part of a $50 gift card to get plenty o' tile tools including tile spacers, a trowel and a grout float. Itching to get started, but plenty more to do in the meantime to prepare. The last thing I want to do is start demo'ing and then realize we never bought the new toilet!